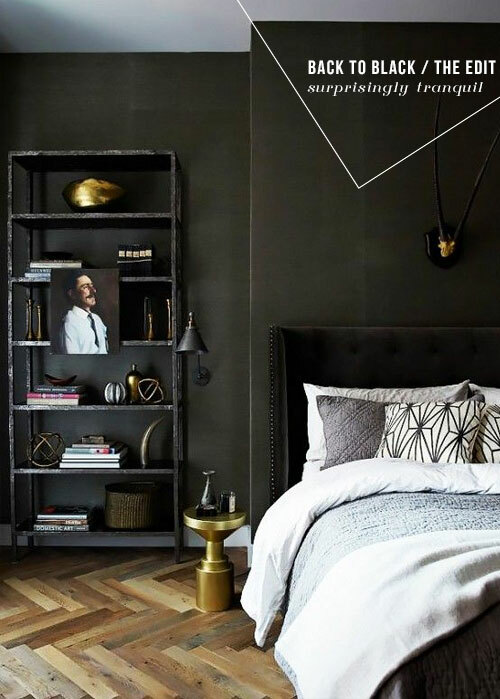 When I was recently asked by the lovely team at Amara to contribute to their 'Top 50 Beautiful Bedroom Ideas', I chose to take a rare trip to the darker side of the decorating palette with the alluring charcoal-coloured loft apartment bedroom (image no.2 'above'). I love how the scheme is instantly warmed by the blonde tones of the the striking herringbone flooring, without compromising the intensity of the charcoal wall colour. Throw in some lighter textiles to freshen the look and we have a highly sophisticated scheme on our hands! Whilst my personal preference is towards lighter pastel tones because of the sense of calm these exude, I do find that during the Winter months, my choices can ebb into darker, richer tones. The way in which these evoke feelings of warmth and comfort as nature's own palette darkens outside, seems to fit perfectly. But as we move into Spring/Summer here in the UK, I'm going to show how black can be for every occasion and Season. Firstly, black doesn't have to be black. This may sound a little contradictory but actually there are now so many shades of black that we are spoiled for choice. These can range from charcoal greys, to blue-black, to jet black. I am really digging the urban-Scandi feel of this chalky charcoal lounge in image no.3 'above', where warmth is injected into the room through the deployment of rich cream textiles and the fiery red wood of the mid-twentieth century furniture pieces. 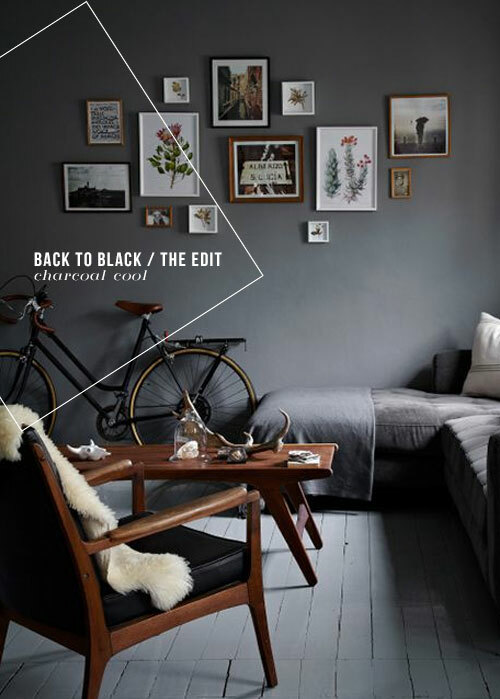 And look at how striking the black frame of the bicycle looks against the dark grey wall, and how artwork adds instant colour, pattern and interest. When people ask me about choosing bolder colours for their homes, especially for the first time, I totally understand why this can seem like a big deal. For some the prospect can even feel terrifying! 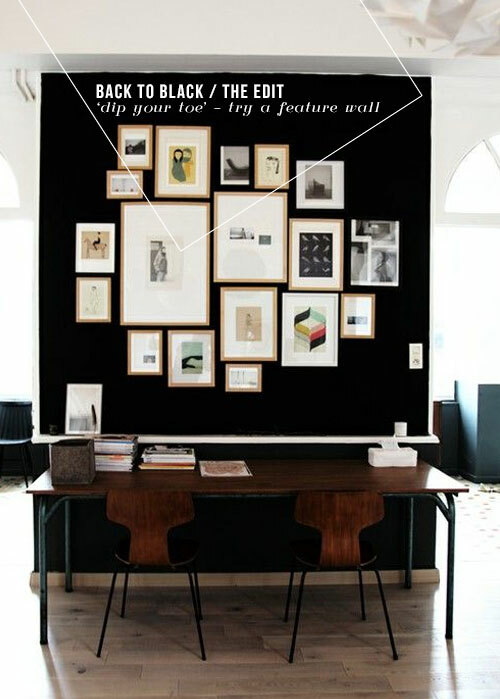 My advice in these situations is to try some 'dip your toe' decorating - by creating one feature wall, as shown in image no.4 'above', to really get a feel for the colour. In this instance, a standalone striking black feature wall makes the perfect backdrop as a gallery wall, which contrasts perfectly with the artwork to create one large frame. Of course no scheme has to be exclusively one colour to work successfully. 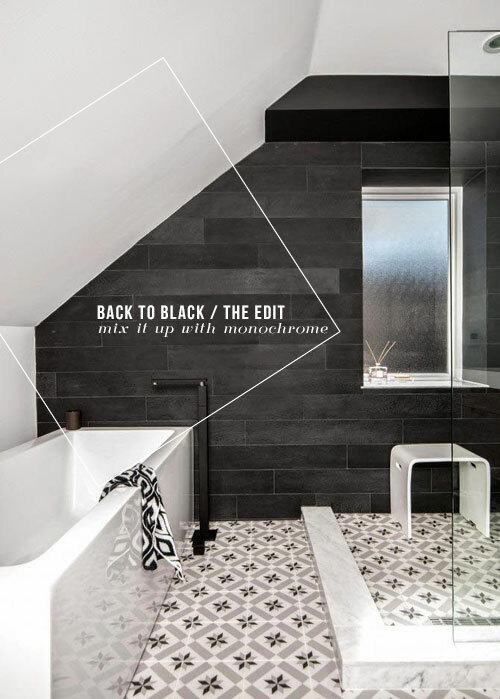 The epic classic colour combo of black and white, is a sure way of delivering high-definition detailing to a scheme. I love how this contrast has been very subtly softened in the bathroom (no.5 'above') by the introduction of a third colour - grey, to bridge the gap between the opposing white and black. 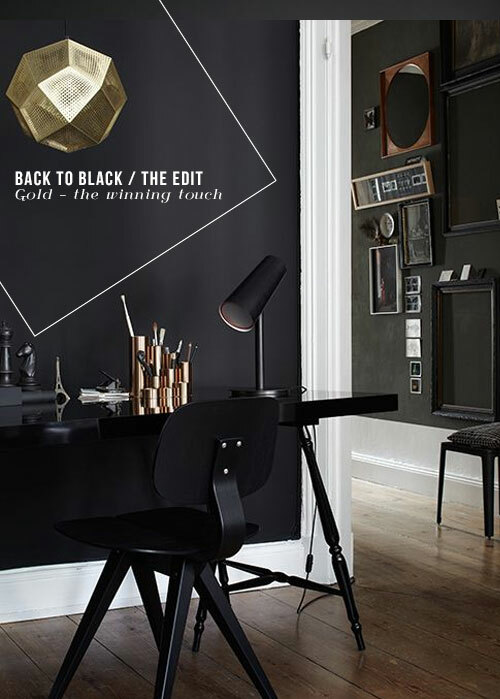 Finally, it's hard to ignore the current winning streak of gold and metallic accessories currently gracing many stylish interiors, as shown in the home office setting (no.6 'above'). 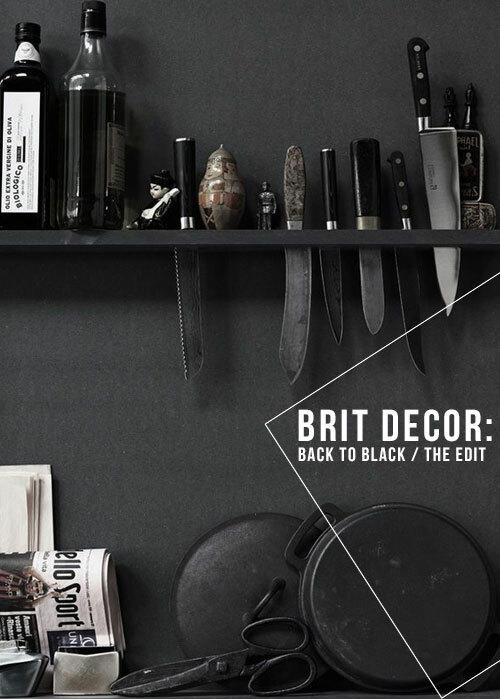 This accent colour provides another knockout contrast when paired with black decor. Gold instantly brings glamour and a luxe feel to any room but when teamed with black, it creates a very high-end look.